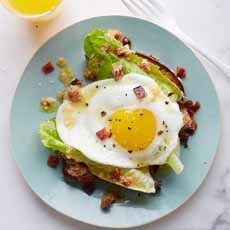  Bacon and egg over Caesar Salad. Deconstructed Eggs Benedict: poached egg, julienned Canadian bacon and English muffin crouton atop a mixed green salad. 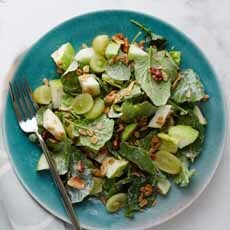 Romaine, apples and grapes with a honey-yogurt dressing, topped with granola (all photos courtesy Food Network; the recipes are below). We first heard of breakfast salad in 2014. Someone sent us a recipe, but it got lost in the shuffle. In the ensuing two-plus years, the concept has spread. So if you’re ready to move on from the last breakfast trend—overnight oats—here’s a roundup of the latest. Breakfast salad is a fusion of conventional breakfast items with salad greens or other raw or cooked vegetables. 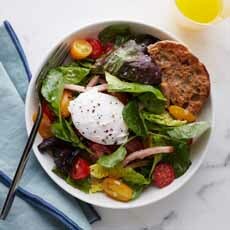 Example: bacon and eggs on a lettuce wedge, or yogurt and fresh fruit salad atop mesclun greens. For years we have served what we never thought to call “breakfast salad”: an omelet topped with lightly dressed baby arugula and watercress; and for brunch, poached egg on top of a frisée salad with lardons, or on top of a Caesar salad. Some were following the breakfast food-and-greens or vegetables concept. Some were serving up fresh fruit atop greens. Some were throwing an egg on top of a grain bowl. Some were featuring luncheon salads (Cobb, spinach-egg-bacon) for breakfast. Some were medleys of cooked vegetables (bell peppers, potatoes, root vegetables) with chickpeas for protein. Some were featuring sandwich ingredients (smoked salmon and avocado) atop greens. Some served what we would call side salads breakfast salads (diced squash and pomegranate arils atop greens, with some almond butter in the dressing). Some tossed greens atop avocado toast. Some even featured a liquid salad, i.e., a green smoothie. Bacon & Egg Breakfast Caesar Salad, the egg yolk served cooked on top of the salad instead of raw in the traditional Caesar dressing. Egg, Sausage & Avocado Breakfast Salad. Eggs Benedict Breakfast Salad, deconstructed Eggs Benedict. Frisée Salad With Eggs & Bacon (what’s frisée and another recipe). Greens, Grapes & Granola Breakfast Salad, romaine, apples and grapes tossed with a yogurt dressing and garnished with granola. Grilled Wedge Salad With Fried Egg & Cranberry Feta Cheese. Potato Breakfast Salad, an opportunity to eat pan-fried potatoes with some egg white and chickpeas for protein. Quinoa, Ham & Pepper Breakfast Salad, a Western Omelet deconstructed on top of quinoa (or greens, if you prefer). Do you have a favorite breakfast salad recipe? Please share! And feel free to eat breakfast salad for lunch or dinner. The concept is no different from an omelet or any luncheon salad.